“In the last century, scientists have successfully developed molecules which can be crosslinked to form one-dimensional and three-dimensional polymers. These are used to produce a wide range of technological products. However, making 2D polymers has met with little success, as most molecules are not flat and they tend to rotate in solution, making it difficult to control their linking to a 2D plane,” said Professor Loh Kian Ping, Head of 2D Materials Research in the Centre for Advanced 2D Materials at NUS. He also holds an appointment with the Department of Chemistry at the NUS Faculty of Science. Mr Liu Wei, who is the first author of the paper, added, “Our team developed a strategy to make 2D polymer sheets by prepacking flat molecules in a crystalline state and carrying out solid state polymerisation. 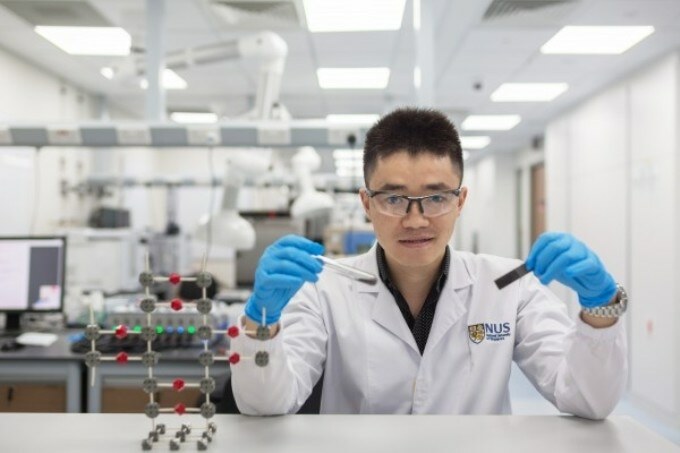 This approach restricts the rotation of the molecules and allow the 2D polymerisation to take place to form carbon-carbon bonds.” Mr Liu is a PhD student at the NUS Department of Chemistry as well as NUS Graduate School for Integrative Sciences and Engineering. The novel polymer sheets synthesised by the NUS team are unique because of their good electrical conductivities and highly regular, sub-nanometer sized pores, which can be used to store sodium ions efficiently and safely in sodium ion batteries. Sodium ion batteries are a type of rechargeable metal-ion battery that uses sodium ions as charge carriers. As there is an abundance of sodium, sodium ion batteries are cheaper to produce than lithium ion batteries. However, the disadvantage is that they do not last long. The 2D polymer developed by Prof Loh and his team can be mass produced at low cost for use as the electrode for sodium ion batteries, enabling such batteries to perform at high capacity for thousands of charge cycles. The design and validation of the novel 2D polymer was published in the journal Nature Chemistry in January 2017. It has also been highlighted in Nature’s News & Views on 23 February 2017. When graphene was first extracted from graphite more than a decade ago, it was touted to be a “wonder material”, and researchers quickly jumped on the bandwagon. This prompted the emergence of 2D materials as a new field of research, and stimulated interest in the organic synthesis of 2D polymers. However, constructing stable 2D conjugated polymers with strong linkages presents complex challenges in synthetic chemistry. Prof Loh explained, “It is particularly hard to make 2D polymers based on carbon-carbon linkages due to the irreversibility of the reaction. Once an error in bond formation is made, it is locked in and cannot be repaired.” Intrigued by this property, Prof Loh and his team embarked on making 2D polymers with carbon-carbon linkages as they are the most stable type of bonds and can be used in harsh environments – for instance, the polymer can remain stable in water, and is able to withstand acids and heat. The basic building block used by Prof Loh and his PhD student Mr Liu is a planar molecule that contains several aromatic rings which consist a series of connected carbon double bonds, through which electrons can move about. The ability of the electrons to move increases the electrical conductivity of the polymer, which is important when the material is used in batteries. The researchers designed this aromatic monomer such that an ordered arrangement is formed. Flat molecules are chosen to maximise the chances of cross-linking in 2D. During their experiments, the NUS researchers discovered that by applying heat to the set of carefully designed, flat monomers which are pre-packed in a specific way, a 2D crystalline polymer is formed. The 2D polymer consists well-defined pores and channels, through which sodium ions can diffuse in and out for energy storage. An individual sheet of this material can be readily peeled using adhesive tape, yielding ultra-thin sheets which are of less than a nanometre. Most organic materials showed poor performance when used as an electrode in sodium ion batteries due to their poor electrical conductivity and inhomogeneous pores. However, this novel organic 2D polymer material exhibited superior stability. When it was used as the anode material in sodium ion batteries, it can be charged and discharged quickly at room temperature, and retained 70 per cent of its capacity after 7,700 charge cycles, which is unprecedented. The new material also worked well when it was tested as an electrode in lithium ion battery. The NUS team’s successful creation of a novel, porous 2D material with enhanced ion storage properties opens up new horizons in the field, and may form the basis of a new branch of crystal engineering. To further their work, Prof Loh and his team are using advanced computational techniques to design other classes of molecular building blocks which can undergo polymerisation in the solid state for the development of other novel 2D polymers.